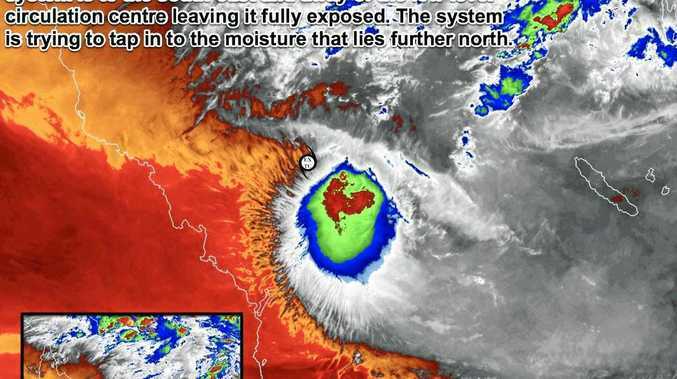 WEATHER watchers are still keeping their eye on ex-tropical cyclone Iris, with one Brisbane-based duo saying there is potential for it to regenerate back into a cyclone over the weekend. But the more experienced chasers, including Higgins, are going with the majority of weather models and the official Bureau of Meteorology forecast, which show for the most part, Iris is fizzling out. "Ex-Tropical Cyclone Iris the zombie cyclone maybe down but not out. Even though the system has been sheared for some time, however, in the last six hours we have seen that increase," Des from Queensland And Sunshine Coast Hinterland Weather posted to social media this afternoon. Despite the significant convection that occurred to the south of the system yesterday afternoon and evening the system has weakened considerably in the last six hours, Des said. "However by the looks of things sheer levels drop considerably from tomorrow evening and sea surface temperatures also increase for the system. The two concerning parts for me is the wind speed and the relative humidity of the system," he said. "The system is trying so hard to tap into the moisture-laden atmosphere to the north if the system can maintain its circulation and the atmospheric conditions do decline we may see Iris Mark 3 the zombie cyclone reborn. "This is something that I am keeping a close eye on as I do believe there is the potential for this system to regenerate from tomorrow night into (Sunday)." According to their 'About Me' section, QSCHW are "unqualified meteorologists" who "believe in keeping the public informed about our changing weather. Which is a fundamental about who we are and that is why we will tell it how it is without the hype and sensationalism". Oz Cyclone Chasers also posted a map earlier today, saying: "the many possibilities for Iris Version 3... will there even be a version 3?" But Higgins Storm Chasing says there is "no convection anymore" with the system, which at 3.30pm Friday was well east of Bowen and travelling slowly north to north west. Thomas Hinterdorfer, who works for Higgins, said while there was one model giving Iris a third chance as a Cat 2 or 3 in the Gulf, the majority of models were "giving it a slow death". 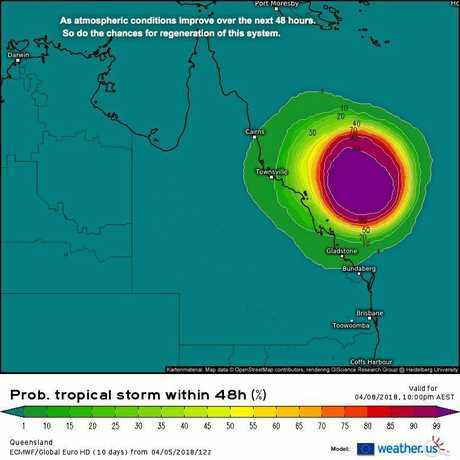 The Bureau of Meteorology says ex-TC Iris was expected to move to the northwest over the next few days and remain off the Queensland coast. "At 2pm Friday, ex-tropical cyclone Iris was situated well offshore of the east coast of Queensland, about 500 kilometres east-northeast of Mackay." The likelihood of another tropical cyclone forming in the Eastern Region was "very low" for Saturday, Sunday and Monday.